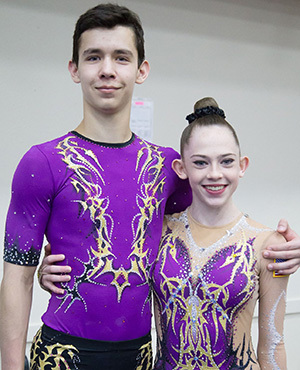 Jordan Gruendler and Timothy Massa, a junior elite 13-19 mixed pair, train with Vladimir Vladev at Acrobatic Gymnastics of San Antonio, and 2019 marks their third year of competing as partners. As a mixed pair, they began competing in the junior elite 12-18 level in 2017. Jordan and Tim represented the United States at the 2018 World Age Group Competition in Antwerp, Belgium, and are the first United States acrobatic gymnastics athletes to earn a berth to the Youth Olympic Games. The pair’s goals for the immediate future are to represent the USA at international events in 2019 and continue working towards the 2020 World Age Group Competition. 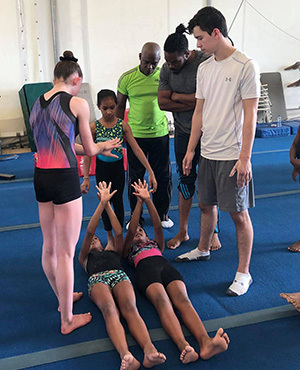 Recently Jordan and Tim were invited to assist clinicians at a Pan American Acrobatic Clinic in Trinidad. The pair performed their competitive routines, worked with participating athletes by demonstrating skills and techniques, and mentored young athletes from Pan American countries that are working to develop acrobatic gymnastics programs. Q. How did it feel to be helping a young team in another country learn about acro? J – Getting to work with the new athletes was an absolute honor. I felt as though I was given the opportunity of a lifetime, and the athletes were amazing. I loved their work ethic and their excitement for the sport. I have never had the opportunity to actually work with people the way I did in Trinidad. It really gave me a different view on so many things I’ve been overlooking in our sport -- things so little and basic that once you get to a higher level you forget about. It actually gave me the opportunity to revisit the early days of my career in the sport and improve myself. Overall, working with these athletes made me feel amazing and reminded me of everything I had taken for granted. Our sport is amazing and honestly overlooked, as most people aren’t even aware of the sport. Getting to spread the wonderful sport that is acrobatics was amazing. T – We did our routines and sessions on half a floor in an open-air tent, a different environment from what we are used to, but we made it work. It was a fulfilling and rewarding experience to teach kids and their coaches who have never done or heard of acrobatic gymnastics before. Q. What surprised you most working with the athletes and coaches? J – Working with the athletes and coaches, I was so surprised by the amount of excitement and ability they already had for the sport. They had never learned any parts of acrobatics before, and each day we presented them with something new. They were never shy to volunteer and were always eager to learn. They took and applied each correction with care and fixed it almost immediately. I can already tell how amazing the country will be with this sport. T – I was surprised by how much each of the coaches and athletes listened. They were attentive and asked lots of questions, really eager to understand correct placement of the skills. Q. How did that experience change your perspective on the upcoming season and your future goals in acrobatic gymnastics? J – In this upcoming season, my views have been completely changed because I now understand how much I do have, such as the amazing facility I get to work in and the coaches who never fail to support me. I would often go to practice dreading the work of the day, but now I realize what a blessing I have in being able to do this sport. I will now approach this new season with excitement and open eyes, ready to work every day. The people I met have encouraged me to do that with the excitement they showed for the sport. T – Being able to do a routine on half a floor was no easy task, but it goes to show that we can perform anywhere. 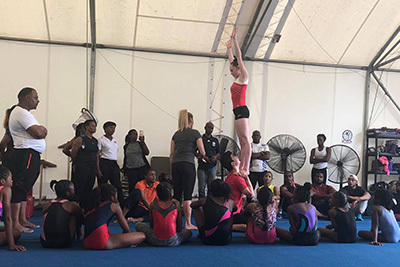 Performing in Trinidad helped inspire kids to try acrobatics, and I hope the news will spread to other Caribbean Islands and the rest of South America. Q. How did you get started in acrobatic gymnastics and how long have you been competing? J – I didn’t participate in many sports when I was young, but one day I wandered into a big metal box on the top of a hill wanting to take a gymnastics class. Boy, I had no idea what I was getting myself into. I did a recreational class for about a year before being recruited onto the acrobatic team, and it took off from there. This year I will have been in acrobatics for seven years. T – I started acrobatic gymnastics because I saw my sister, Zoe, do it and I wanted to give it a try. Before I knew it, I fell in love with the sport. This will be my sixth year competing, and my third year with Jordan. Q. Can you tell us what a typical training week is like for you? J – A typical week of training consists of 27 hours a week. I start on Monday from 9 a.m.-12 mp.m. by myself for blocks and conditioning practice, then I go back home to do school work until 4:30, and finally I will practice from 4:30-8:30 p.m. with Tim. On Tuesday, I only practice from 3:30-7:30 p.m. with Tim, and Wednesday is the same as Monday. Thursday is our day off and Friday is the same as Tuesday. On Saturday, we have a five-hour practice to end the week from 9 a.m.-2 p.m., with a15-minute break at 12 p.m. Sunday is another day off. T – Since returning for my senior year at Claudia Taylor Johnson High School, we practice five days a week, 4-5 hour sessions, averaging 21 hours a week. J – This trip was life changing for me, and I want to continue to help spread our sport in hopes of it being as widely known as artistic gymnastics. I am forever grateful for this opportunity and will never forget it. T – We would like to thank Tonya Case for giving us this opportunity to help grow the sport of acrobatics. This is an experience we will never forget. We also appreciate our host friends from Trinidad. They made us feel welcomed and their hospitality was amazing. A big thank you to our families for their continued support and to our coach Vladimir Vladev for training us to be ambassadors of this sport.